Tires on the ground in obstacle courses, that you have to run through. I wondered why they didn’t have those at parks near me. Then I realized they would be a good place to get mugged. – That would be bad. What I wish people would use more often. Though if you’re using headphones, but still singing loudly, that kind of defeats the purpose. Maybe what we need is mouth phones… to cover mouths and muffle singing sounds. Or those big clear half domes people would use in old sci-fi shows sometimes, to have “secret conferences.” I’d totally go for sticking a dome on some people’s heads! I think of faxes. Fax machines. My friend’s father had one at the house, when we were growing up, for work. The old kind with the reams of paper with perforated edges. This was before most people had home computers, or home printers. Rolls of paper poured through the fax machine all the time. It was supposedly very cool and people were excited about it. I didn’t understand what was so great about it. It was just words. No pictures or anything! On the 20th… (it’s a musical.) I remember the commercial’s music for it. I also had a poster for it in my room. 100 too of course. I think of that. I could live to be 100…. How the heck would I pay for all those years ahead? I think of unsteady of course. Shaky. I did bye bye birdie once. … The chicken costume my mom made me. My grandmother used to work at a golf course. She loved golf. My “grandfather” (sort of a grandfather) used to drive me around in the golf carts. I remember him showing me one that would follow you if you put a remote in your pocket. I thought it might be a good gag to slip the remote into someone’s bag. Didn’t do it, but thought about it. Years later I was in a golf cart with my sister. She was driving. I realized in that moment, how peaceful the golf course was. I’d never understood that before. I’d thought they were boring. But life is so hectic now, that I noticed…. peace….. I dream about spending time on golf courses now. Not playing. Just being there. A friend said she grew up on a golf course. I imagine it was very peaceful. I like them :) I cut up bananas and freeze them in small pieces because they’re easier to use and to put in smoothies that way. My friend had a frozen smoothie mix when I went to visit her that was really good. It came in a bag. I was sick the whole time I was there, but drinking and feeling that go down my throat was the BEST TASTING THING EVER!!! Unfortunately it was also expensive so I didn’t want to use up her mix too much. Wish there was something that good AND cheaper. It didn’t just have bits of frozen fruit. It also had frozen bits of yogurt or something. Great… now guess what I want RIGHT NOW. I don’t think I ever “almost” anything. I really don’t. I think I’m very Yoda-ish in that way. There is no try. There is do or not do. I do or I do not do. I succeed or I fail. Or I’m still working on something and not there yet. But I don’t think I’ve ever “almost”-ed anything. Or at least I don’t think that way. I either succeeded, or didn’t. I know there are people who may read this and think “My house, my rules.” That’s fine to an extent. I mean of course you’re right. But then don’t be a jerk about it. Don’t violate your kid’s privacy and security in a destructive way. Don’t throw away their things when they’re not home without asking. Don’t jump to conclusions about things you read in a diary (which is really none of your business. Sorry.) If you claim to be a “concerned parent” then be an actual concerned parent. Have a good relationship with your kid. Don’t be a crappy parent, with a crappy relationship, then toss your kid’s room once in a while because you’re nosy, and use “concern” as an excuse! Do I sound bitter? I am. Funny how things hang around. For what it’s worth, I’ve never used drugs, never smoked, never drank (I’ve had sips of stuff that looked good! But I don’t drink. Alcohol doesn’t “work right” on me, so there’s no point.) I was ridiculously obedient. There was nothing to be suspicious about. Oh and as for the “their house their rules” thing… one of my parents will still go through people’s things any time they’re left alone somewhere. My things, your things, friends’ things, strangers’ things… It’s not about concern and it’s none of their business. My being a kid in their house was no different. – Think it’s weird that I got away with putting a padlock on my door as a teen? – Me too! Certainly THAT was a reason to be suspicious! But really, I’d just had enough. I’m thinking about a recipe book my mother had since I was a child. The Joy Of Cooking. Somehow, I’ve always felt like I should have a copy in my home because it was part of my childhood home – even though as far as I know, we only ever used two or three recipes from that book: Apple pie, pumpkin pie, and maybe banana bread. I could just print out copies of those three recipes, or possibly get even better ones from the internet. And yet, I somehow still feel the need to have that book in my kitchen. I just do. oh no… roadkill… that is what is coming to my head. I don’t want to think about that. How about a balloon… or… a penny! I got (I think) my first pressed pennies the other day. I’ve always looked at those machines and thought about getting one but I’d think “THEN what am I going to do with it?” – So of course I didn’t get any. This time my answer was “Don’t care!” – and I got one. Three, actually. – Now I’m not sure I know where the heck I put them. – Really? That always seemed pretty slow to me! By the time he finished saying that, Polly could be dead! They used to tape a sitcom near me. I would get free tickets to sit in the audience. I loved going there. I wish they still taped something nearby, and not very known about. Now, if they had something like that, there would be hoards of people and I’d probably never get in. It was fun to watch. Kind of a combination of theatre AND TV. But it was like theatre with characters and stories I already knew something about and had a kind of relationship with. … Serial theatre.That might be a good idea. IF it was done well. Somehow, I think if it was actual theatre, it’d get boring and stale and old and dull quick. I don’t know why tv shows, week after week, (normally) do not have that problem. Too bad. I liked watching that show. – I miss the purple! I really do. I missed it when it changed to black. Now translucent… I liked the good o’le days of the light purple. I guess I don’t like change very much (in any area of my life) when I like whatever is already there. – I really shouldn’t go near people who are fishing. I get sad. And then I get panicked that I’m going to see something I don’t want to see. Yes, I eat fish sometimes. Yes that’s pretty dumb. I work very hard to shut out the thoughts of what I’m doing. Our camp mess hall was like a big large wooden barn. Lots of long tables…. counselor would get food at the head of the table, and serve, and plates/bowls would be passed down the table. At some point there would be camp songs… I don’t remember exactly how or when or why these started during meals, but people were very enthusiastic. Ok that’s just going to bug me. Now I’m thinking OCD… I guess I have more than I should if all I can do is look at a misspelled ‘mispelled’ word! Although… maybe “pelled” is something… Something that was ‘mis’d – Now I have to look that up. Nope. “Pelled” is not a word. Not sure why, but I picture a novel, with a watchtower on it. Was there a novel called that? I am not a big reader, so I doubt it’s anything I ever read. But I might have seen the book cover. I guess that really does tell you how much I read. I equate religious spam with cheap novels. Chocolate. I picture a chocolate cake. Rich. – Because isn’t that what this word is usually used to describe? Chocolate and cake? That and parties, with crystal chandeliers (which really, anyone can get pretty cheap nowadays) in a big white marble ballroom, with people in tuxedos and long white gowns, with their hair up, sporting diamonds and drinking champaign, at a party… – that’s serving rich dark chocolate cake. What I’m doing. I guess… I don’t know what to do. Is that stalling, or waiting? I think stalling is maybe, if you know what to do, you’re going to do it, and you’re trying to take as long as possible before having to do the inevitable terrible bad thing that is making you anxious. Waiting… I think that’s different. I think waiting is… when your choice is to not do something. Not unless, and until, you can figure out how to do it ok.
hmm… the first thing I think of is how I never wanted to have children. Well.. maybe I did when I was very young and played ‘mommy’ with dolls, but by the time I was around ten, I knew I didn’t want to have my own children. Adopt? Maybe. I could be up for that. But I felt like there was so much terrible stuff in the world, and I don’t have the greatest genes. I knew I’d love a child immensely, and I didn’t want to feel responsible for anything I subjected them to by “bringing them into this world.” But someone else’s child? One that was already here? I figured their being here wasn’t my fault! Someone else brought them into the world! And since they were already here, I figured I could give them the best life possible. – Not a very well rounded view of course! I wasn’t taking into account that some kids up for adoption come with issues I might not have been able to handle (though I thought I’d magically be able to fix everything with love and stability.) I also hadn’t given any thought to the amazingness of combining your own genetic material, with the genetic material of someone you’re madly in love with, and making human being that’s a combination of BOTH of you! Half your “stuff” and half theirs! A person whose biology is half from you and half from a person you think is incredible! How MIND BOGGLING and AMAZING is that?! The concept of it! So there are things I hadn’t quite considered at ten! I might have been persuaded to have children, under the right circumstances, but I never really had that drive to have kids. Some people NEED to have kids. Or at least they feel like they do. I didn’t have that. Maybe my lack of drive to procreate was also genetic. A kind of built-in safeguard. Natural selection. Turboencabulator. Complete with nofur trunions, reciprocating dingle arm, and of course side fumbling is effectively prevented. I LOVED overalls!!! If I didn’t realize how dopey they look on me now, I’d totally STILL wear overalls! If I had a job that required overalls I’d be very happy. Like an engineer. 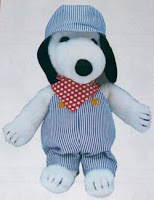 Or… a Snoopy impersonator. Ok no. How lame would that be? I loved science. I pretty much already said that a few days ago. Well… I talked about physics. I liked chemistry too. Wasn’t as interested in biology except as it related to medicine. What else is biology good for really? Physics and chemistry though? Loved them. Just did. Second thing is the customer service call I made once about a new modem I’d bought that wasn’t working. Previously, I’d always had built in modems. I’d never had a stand alone one before. Tech support and I troubleshot it for over an hour before I noticed the stupid thing had a POWER button. – Yeah that’s right. I hadn’t turned it on. And tech support never asked if I had! Was just thinking about a train station I’ll be going to. There’s two main ones where I live. I still feel like the other one is “my” train station. The one I grew up with and always used. I liked it. Loved the station itself. Had good memories going in and out of there. The one I’m going to soon… I don’t know… it’s different. Not “mine.” I wonder if, at this point, I’ve used it as much or more than the first one. I still don’t like it somehow. I feel stressed… saddened, in a way, when I’m there. I know where I’m going, it’s convenient in ways, and yet, I still don’t think of it as “my” station. First thing that came to mind was learning to ride horses. So much I could write here but won’t. I learned from someone who was a real jerk. So it’s probably little surprise that when he forced my horse to jump, rather than letting me circle it around to get momentum for another attempt, I was pleased to hear that I’d kicked him in the head while hurtling through the air when the horse threw me. Physics classes in Jr. High. I went to a great Jr. High School. Among its merits, was that we were allowed to choose our own classes – something that wasn’t usually allowed until High School. So long as a class could justifiably be said to fulfill state requirements, we could take it. I took several physics classes. Loved them. I think the reason I didn’t go more in that direction as an adult was the theoretical aspects of physics after a while. I like concrete. I like knowns. Or at least working largely within knowns. I can speculate as to unknowns, but I want to know answers in the end. That’s why I have often so much patience with puzzles. The kinds that make other people feel crazy and stupid? I figure if it’s a puzzle, (a regular puzzle, not a “meaning of life, the universe, and everything” puzzle) there’s a definite answer and a solution. And if other people have figured it out, I can too.